for the most part i agree that the game does share a similar tone to the studio ghibli films, but the direct comparison is a bit unfair since its scope is so much smaller. i would say that kit from nintendo summed it up well when he said, “i got a great sense of nostalgia from this game, and i did not grow up in tokyo in the 1970’s”, i.e. even more than the story and characters, such as they are, what’s really engaging about the game is its ambience. i agree with him that the game’s relaxed pace is its big draw, and i can easily imagine how indebted the game must be to millennium kitchen’s my summer vacation series. 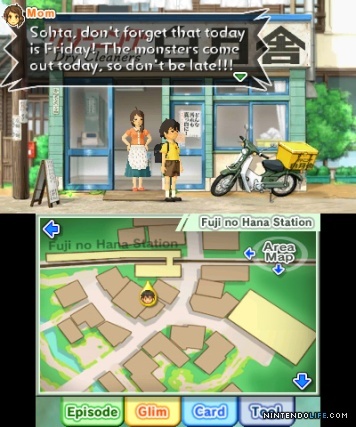 the game also walks an interesting line between story elements being part of the child protagonist’s imagination and his view of the world, versus an actual fantasy on a cosmic scale. anyway, all of this was a nice change of pace and the game nicely captures the freedom and wonder of childhood, but i wouldn’t say this was a “great” game per se, or even that it had a “great” story. i’m certain that a lot of people would find this to be way too cute for their taste, and it (as well as other recent japanese media) sometimes feels a little bit too enchanted with childhood and nostalgia. the game’s card battles feel superfluous and the simplicity of the mechanics ensure that they’re never a focal point, in which case it’s somewhat surprising that they become a focus in the post game, so much so that i gave up on completing all the remaining goals because it would require way more card battles than i was willing to put up with. all in all it’s great that we got a localized version of this game and it was a nice way to spend a few hours, but more than anything it left me wanting to re-watch all of those great studio ghibli films.